When He gave His life for me. As He hung upon that tree. Today He still whispers to me. Yes, My child, it is true! As I gave My life for you! Pendant measures 30mm (1 3/16") long and 25mm (1") wide and comes with an 18 inch Sterling Silver Chain. 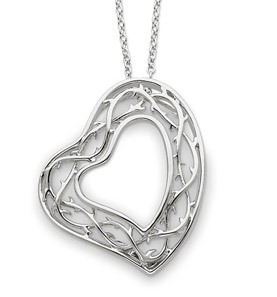 We guarantee our Sterling Silver Amazing Love Heart Pendant to be high quality, authentic jewelry, as described above.